Featuring the most popular bodybuilder on the planet - 2006 Ironman Champion Lee Priest - in the gym and onstage! Watch Bodybuilding Superstar Lee Priest train a few DAYS out of competition in his hometown Austin, Tx! Lee was in the best shape of his life. 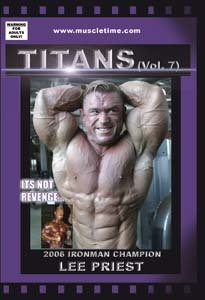 Also included in this DVD: Backstage, Prejudging (with Troy and Dave), Evening show and posedown at the 2006 Ironman. Plus Inroom, Victory dinner, 540 hp Mustang and saloon footage! A Muscletime Production. Running time: Approximately 120 minutes; Widescreen; All Regions, NTSC.